The Crusoe boys, Robinson and Willy, find themselves thwarted in their hopes of marrying their sweethearts. 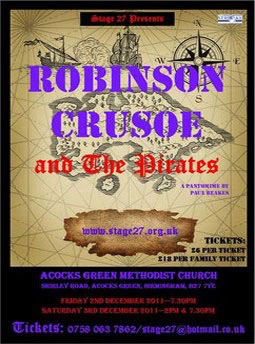 But as luck would have it, Robinson inherits his uncle’s treasure map and sails away with Willy and their mother, Ma Crusoe, in search of untold wealth and happiness. Unfortunately the way is littered with obstacles – including the villainous pirate Blackbeard who has his own beady eye on the treasure. Can Robinson navigate King Neptune’s underwater kingdom and a shipwrecked island to find the treasure and rescue his friends?